The vehicle interior had not been clean for the last 3 years. Also the laminated flooring that protects the carpet are torn and damage. We we thinking of installing wooded flooring but after much consideration, we scrap the idea. Why waste a perfectly good carpet and we did like the soft feeling on our feet. We decided to use clear plastic wrap which is normally use on dinning table or wrapping school text book. These are slightly thicker. Spent 2 hours vacuum the whole interior and another hour installing the new protection. We only install area that we move often, under the storage compartment was left untouched because the carpet itself will prevent the gears from sliding around. With the new carpet protection, it makes cleaning much easier. 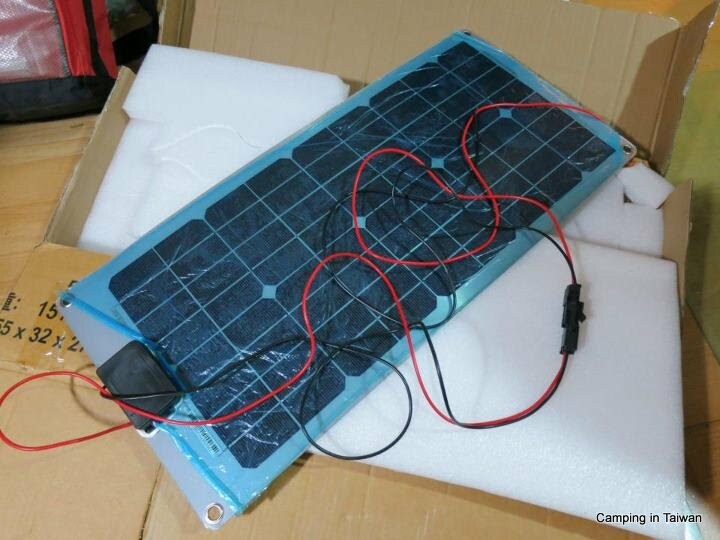 I could not find the type of Solar Panel needed for our BOV Solar installation in Taiwan but managed to get one from China instead. I needed a Semi-Flexi 20W Solar Panel which is lighter and more durable unlike those glass reinforced with Aluminium frames that are much heavier. Delivery took less than a week and the package was well packed. Also included was a 2 metres cable with connectors and that save my effort to hunt for more cables and connectors. Currently I got only one Solar Panel to test it out, if it is good, I will get probably 2 or 3 more to ran in parallel for more Amperes for BOV camping and survival. Base on the calculation a 20W Solar Panel only produces 1.2 amp current. It is definitely insufficient if we were to use for self sustain BOV camping. LED x 3@ 0.12amp = 0.36amp = 1.44watts x 3 = 4.32Watts hourly and for 8 hour in the evening = 34.56Watts. Got this Solar Charge Controller locally made in China by Mobolo Electronic Technology Co. Ltd. It came with a 3 page Mandarin user instructions and the Solar Charge Controller. This model is EPOW-PS10 10amp PWM Solar Charge Controller, on their website you can download the User Instructions but it is in Chinese. PWM, Pulse Width Modulation are one of the most sophisticated technology as it is able to monitor, adjust and control the charge going into the battery.